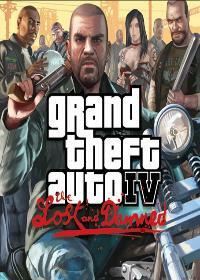 The GTA 4 Expansion GTA The Lost and Damned, the second expansion for PC has been released. Since then, fans could now draw on their home PC and not only consoles player on a rampage as Rocker by Liberty City of GTA series. Here we have the Cheat Codes added for you, which you have to enter as a phone number like in GTA 4. In this Cheat List 17 active cheats are available. The Custom Street Cruiser Bike Witcher is one of the new bikes in GTA 4 The Lost and Damned. Here we have the cheat code for the witcher bike for the PC for .. The Double T Streetfigher motorcycle also expands the range of two-wheeled vehicles in GTA 4. Leave this with The Lost and Damned new bike you can with this .. The Asian-looking Sportbike Hakuchou is something for everyone who would like to be on the road more quickly to the streets of Liberty City. Of course, this ..
GTA 4 The Lost and Damned offers you for the PC also a second Street Cruiser Custom Bike. The innovation you can summon also with a cheat code. Give the chea..
With GTA 4 The Lost and Damned some rocker gear are typical vehicles were added to the game. For the PC, you can the Burrito Van with this cheat create after.. The Slam Van is another new vehicle in GTA 4 The Lost and Damned. These rockers Van you can make it appear in front of you also with a cheat code. Here the C.. In GTA 4 The Lost and Damned you can write to the PC and the arms, ammunition and life energy refill. For this you only have to enter this cheat in the GTA p..
Also speed boat you can move again in GTA 4 The Lost and Damned on the PC over the water to Liberty City around. This speedboat you can also do a bit faster .. The already known from GTA 4 Kross machine Sanchez you in the expansion The Lost and Damned revoke a cheat brought. Give the cheat as ever as a phone number .. The NRG 900 sports machine is, of course, to evoke by means cheat. Here you find the cheat phone number for the GTA phone. You can also make your wanted level raise in GTA The Lost and Damned. With your GTA-phone you can activate the cheat. Even lower back can you wanted level. Type in the code as usual in the GTA cell phone while the game is running. Again fill with a cheat code your armor and health. This saves you the annoying search for protective vests or sausages and burger sellers roadside to rechar.. Here is the cheat for light weapons on the PC. Give the cheat as usual in the GTA phone and you will receive these light weapons: knives, Molotov cocktails, ..
A cheat for the heavy (strong) weapons, there are also on the PC. After you enter the cheat as phone number into GTA phone, you´ll get these heavy weap.. Here the GTA cheat code is for the PC to create an armed helicopter in front of you. The cheat you have to call this number with the GTA phone. In The Lost and Damned, you can change the weather on the PC. Is it all too sunny or rainy, you just have this cheat as phone number into GTA 4 phone call an..